From the Star Wars The Last Jedi collection by Hasbro. 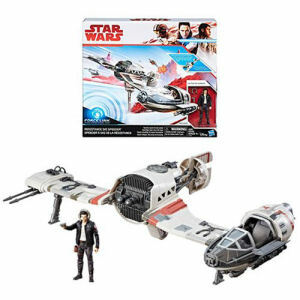 Star Wars The Last Jedi Resistance Ski Speeder Vehicle with Poe Dameron Action Figure. From the Star Wars The Last Jedi collection by Hasbro. Star Wars The Last Jedi Resistance Ski Speeder Vehicle with Poe Dameron Action Figure. Vehicle can interact with the Force Link band and measures 17 inches wide. Action figures measure 3.75 inches tall.